(Newser) – His death Wednesday was widely reported to be a suicide, including by Lady Gaga, whose music video "Born This Way" helped make his tattooed face famous. 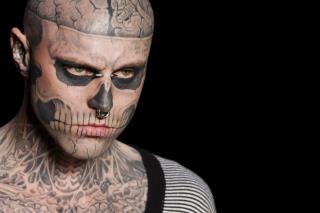 But the family and manager of model Rick Genest, aka "Zombie Boy," are telling everyone to pull back on the conclusion that he took his own life, instead suggesting he accidentally fell to his death. Karim Leduc, Genest's manager, confirms to People that the 32-year-old plunged to his death from a third-floor balcony in Montreal while visiting his girlfriend, but Leduc insists Genest simply leaned too far back on the "dangerous" balcony while smoking a cigarette and fell to the ground below. The management company that represented Genest also said in a statement to People that the cause of Genest's death "is yet to be determined." Something that looks like this had a girlfriend? What did SHE look like, death warmed over?
" It was Genest's girlfriend who discovered his body " this article states. Damn, you mean this freak had a girlfriend ? ?